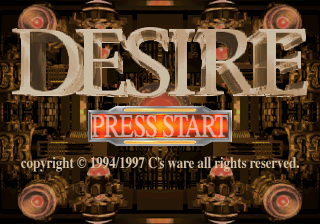 Desire (デザイア) is an adventure game developed by C's ware and published by Imadio for the Sega Saturn. The game comes with trading cards. The premium pack comes with an additional calendar and Eve The Lost One demo. It was originally released for the PC-98 in 1994, and then ported to the Saturn in 1997. The game sold 120,992 units for the Saturn in Japan, as of 1997.More... It was a visual novel created by a team consisting of Hiryoki Kanno and Ryu Umemoto; they later created Eve Burst Error, and then joined Elf, where they created Kono Yo no Hate de Koi wo Utau Shoujo Yu-No. DES_ABS.TXT TXT (Abstract) 197 About this game.